We live in a world where it is very easy to make people believe what we want. It happened also speaking about William Delbert Gann. I have studied his work, and still I do, he was great, a trader aware of what the Market is, but he was not always right, and it means that if we study him, we are not looking for a perfect system, but just a way to make profits. Unfortunately a myth around Gann raised, and it was very dangerous for most of the traders that started studying him. Usually we misunderstood the fact that he was a great trader, but not perfect doing forecasts. I don’t want to do a biography about Gann, you can already find everything about him on internet or books, but what I show here is what people usually don’t say, and these are just facts (like in trading, people miss to look at the facts!). How many real documents do we have about his forecasts? It is important to reply to this question because in my experience I have learned that it is better to believe only in what we see. You know, we have many people saying wonderful things about Gann! For example everyone knows that in 1908 he opened two Accounts, in one he put $ 300, and in 3 months he made $ 25.000. In the other one he put $130, with a profit of 12.000 USD in 30 days. Any real document about this unbelievable performance? He provided a “famous” Supply and Demand Letter for about 40 years, so, why do we have documents about his forecast for only a few years, like the 1929 and the 1922, but no documents about his forecasts during the other years? Let me understand: we know exactly how much money he made in 30 days on his personal account in 1908, but we don’t know almost anything about his forecasts provided for 40 years??? OOOOOOK! Do you know the Modigliani Fake Heads Story? A very funny Italian story, a true story! The Journal of Commerce and The Evening Telegram, again, speak about his incredible skills doing forecasts, but always speaking about the past! Why is it so hard to find these forecasts when they were published, “12 months in advance”, as the Journal of Commerce says? However, the most reliable forecast comes from the book “45 years in Wall Street” written in 1949. Gann gave his view about the 1950-1953, and this is a real document, because we have the certainty of the date the book was published, so we can test his forecast without any doubt. Let’s be honest: there is not so much perfection in this forecast! And in 1949 I think he was better than in 1909! 40 years more of experience! Let’s see the forecast about the 1951-1953, maybe it gets better. William Delbert Gann wrote: During 1951 and 1952 the economy system will go through a big depression and the Stock Market will see a Bear Trend. Many Stocks will fall down to unthinkable levels. In November 1952 there are good probabilities that a Republican President will be elected and during October and November the Bear Market will finish… Interval times suggest that the economy will not start growing till April or June, but during Summer and Autumn Stocks will go on to move higher and the economy system will give very positive signals. 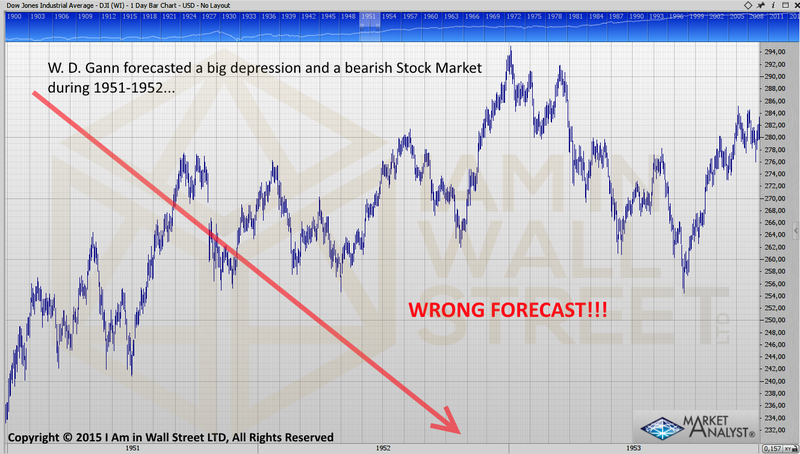 The forecast is wrong (except for the US President election)! No one big depression in 1951-1952, no one Bear Trend! Actually, if we bought the 1st of January 1951 we would have not seen the position in loss, ever! The forecast about the end of the downtrend in October and November 1952 is not bad, this is actually a good buy opportunity, but we don’t come from a Bear Market. The Market did a Low in September 1953; Gann did forecast an uptrend of the Market starting from Summer… not so precise here as well. 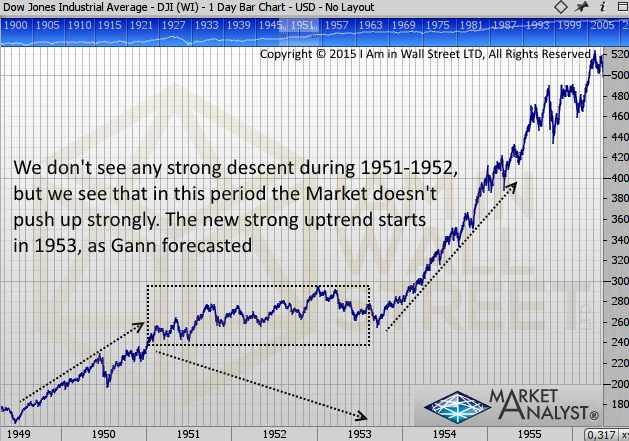 Do you still believe that Gann was perfect? I have studied Gann for many years, I use his work to make my studies as well, but I use them for what I have understood about him, and not what people think he was able to do. His forecast has been wrong during 1951-1952, but it is also true that the Market stopped pushing strongly up during this period, and the Stock Market restarted pushing strongly up exactly when he was forecasting the end of the downtrend. Do you see the correlation? Do you see why it is good to have the forecast, but it is also good to use a strategy if something goes wrong? We can make a lot of money when the forecast is right, for example from 1953, but we had to be careful when the Market didn’t push down during 1951-1952. 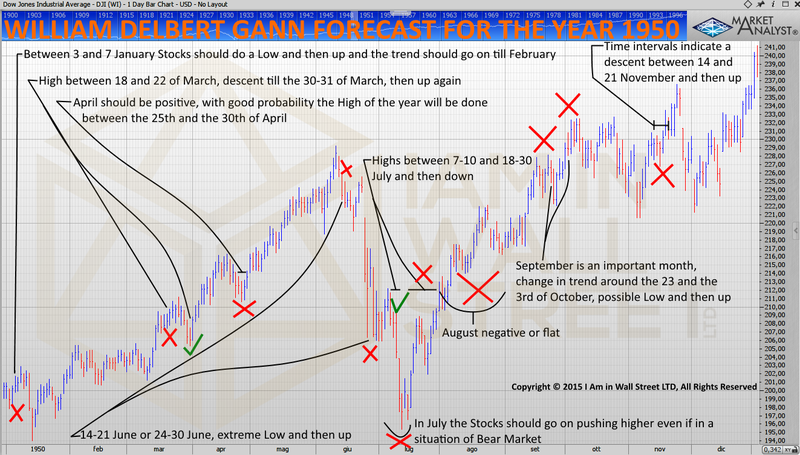 I Am in Wall Street Ltd works in the same way, I know it because I do similar forecasts as Gann did (sometimes wrong)! However, the strategy makes the difference, when you make big profits with the right forecast, and take little losses with a wrong forecast. I did not write this article because I wanted to speak badly about Gann (which remains one of my main guides), I just want to make people open their eyes, helping them to not waste their money believing in fairy tale. We know what we are talking about, we know it is easy to believe that the forecast is the solution, but it is not! The forecast is very important, but the strategy is not less important if we want to trade to make profits! We don’t have to believe in any word doing this job, we are dealing with numbers, not with words, and only the numbers are the true answer of what we should be looking for! Do you want to believe in rumors? Do you know the rumor about W. D. Gann’s son, where he says that he has never seen any money that people say William Delbert Gann made? Wake up!